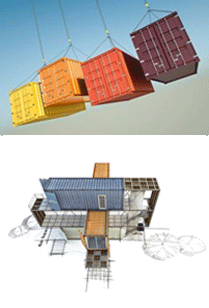 In the end form met function in every aspect of shipping container construction. There were so many interests and needs to satisfy in the world-wide effort to standardize the shipping business, that it is a miracle that standards were ever adopted. For the most part, standards then reflected the best practices of functionality. Sometimes standards had to be modified as reality set in. When the International Standards Organization hastily adopted corner fitting standards, but failed to set load maximum standards, some containers failed because the original fittings had not been tested at maximum weight levels. Shipping container construction was hastily stepped up to add more steel to the fittings, and the standards were duly changed after-the-fact. The new standard shipping containers caused a problem when they began to be loaded on railroad flatbeds. It was discovered that the end panels of the containers had to be reinforced to account for the extra pressure placed on that part of each load as train cars are linked, unlinked and subjected to lots of extra force. The end panel reinforcement added about $100 to the cost of the containers. Again, the function dictated the form in shipping container construction. The very early standards efforts recognized than no one size of container would fit every shipping situation. Therefore, a family of 5 different sizes was adopted as standard: 20 ft (6.1m) 40 ft (12.2m), 45 ft (13.7m), 48 ft (14.6m), and 53 ft (16.2m). In the U.S. the most commonly used sizes are the longer ones. In Europe the 40 foot size is most common. The key to making the various sizes work is that all containers have standardized corner fittings that will work within the honeycomb racking construction onboard ship and the fittings on rail and truck flat beds. The two materials most commonly used in shipping container construction are steel and aluminum Aluminum is particularly popular in the United States for containers that will be used heavily in trucking transport because of highway weight restrictions. Aluminum is a lighter material than steel. Steel is heavily used for container construction in overseas markets. A newer type of steel, called Corten, is rust-proof and mold-proof, making it a popular material not just for freight containers, but also for container building uses.